Today hubby took me out for lunch to a Chinese Restaurant which is at what all Kenyans know as Lighthouse. Its like recreational place by the sea. Looking over from the cliff, you can see the blue sea, watch ships passing by, enjoy roasted cassava, roasted sweet potatoes, roasted corn, fried cassava, cassava chips, coconut water, ice creams and lately boiled eggs, sodas, potato chips have been added. This is one place that no body leaves Mombasa without visiting. As you enter the famous Mama Ngina Drive as the road is called, from the ferry side, you’ll be greeted by really big, fat trunked baobab trees. If you enter at the other end, you’ll pass State House, the official Mombasa residence of the President and come to the famous Mombasa Golf Club, founded in 1911. Lighthouse has many fond memories for me. Its where we’d come with my cousins whenever we visited Mombasa. We’d walk all the way from their home, run around, enjoy cassava chips served in cone shaped newspaper and then walk back when it became dark. Pretty safe to walk back then. After my marriage, that’s where hubby would take me when I had a serious craving for Choco Ice a vanilla chocolate ice cream sold by Lyons, brought to Lighthouse everyday in the afternoon by ice cream vendors pushing little white carts. Its where we’ve brought our kids when they were young, its where hubby and I have sat in the evenings to enjoy the cool breeze when we’ve had power cuts for long hours as our previous apartment would become like an oven. Its where my father in law and mother in law would meet up with friends every evening. Basically Lighthouse use to be full of life and you’d definitely meet someone you know. Nowadays the story is completely different. Its become so filthy, temporary structures with plastic, wood and stones are put up everywhere. Food is sold there and the surrounding is strewn with plastic bottles, papers, broken plastic chairs, stones, basically making the place very uninviting. Once I saw a tourist bus there and felt, that they were brought here so that they could see how as citizens of a beautiful country, we just don’t know how to keep it clean and beautiful. I seen a few of the old baobab trees chopped down, matatu drivers, touts, and the youth idling around there have become a menace, banging on cars and windows. Tuktuks and matatus stop in the middle of the road. Just so much filth everywhere and no law and order. Its such a shame. Charity Clubs like Lions Clubs, Rotary, Round Table over the years have put in so much effort and money to make Lighthouse a place of relaxation for all but unfortunately Mombasa County has not taken it up on them to keep it that way. Pay the cops a few shillings and overnight illegal structures are put up, messing up the area. Day 15 breakfast is Oladushki, Russian pancakes from RUSSIA. They are slightly different from the normal pancakes we make as kefir is added to the batter. Also the pancakes are small in size, more like bite size as the name suggests. If you don’t have kefir use yogurt or buttermilk instead. Oladushki is a popular Sunday brunch item in not only Russia but also in Ukraine and Belarus. 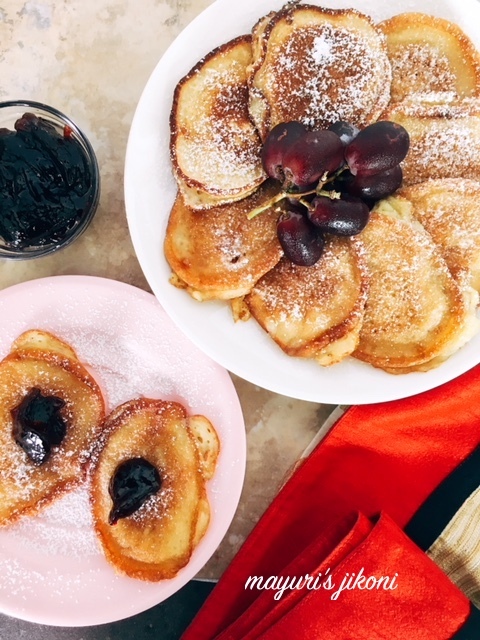 These small pancakes can be served with jam, honey, sweet condensed milk, sweet yogurt or as a savory option too with sour cream and caviar or salmon. The batter can be made using wheat flour or buckwheat flour. I opted for wheat flour as I didn’t have any buckwheat flour. Sift flour, salt and baking soda together into a big bowl. Add sugar and mix well. Mix egg, yogurt or kefir together. Mix till the flour is incorporated into the liquid. Don’t over mix. The batter will have become all nice and frothy. Do not stir it again. Heat oil in a shallow pan about ½” or so over medium heat. Take a tablespoon and scoop up the batter from the side of the bowl. Repeat steps 9 and 10 till you have about 4-6 pancakes sizzling in the pan. The number is obviously depend on the size of the pan. Once you see the edges have turned golden brown, flip the pancake over and let it cook. Remove from the pan onto a plate which is lined with some kitchen towel. Repeat steps 9-13 till all the batter is over. Serve hot pancakes with honey, jam, sweet condensed milk, sweet yogurt, fresh cream,cream cheese, salmon, caviar or any topping of your choice. I chose to serve it with some strawberry jam. Its the bubbles that develop that makes the pancakes really fluffy. So don’t mix the batter after it has rested. As soon as they come out of the pan, the pancakes deflate a little but they are so soft and delicious. Don’t make the mistake of pressing the pancakes down with the spatula. They will not be soft and fluffy. Can be kept warm in the oven till ready to serve. you brought us a slice of your town and Russia in this plate. I am hoping my kids will take to pancakes so I can start making them. As of now, they (actually we all :p) prefer savoury breakfasts except for an occasional cereal / muesli . this dish is so easy yet inviting ! We occasionally like having sweet breakfast especially on a Sunday. However, after that to add some spiciness we all need masala tea! Ah I do enjoy reading your intro to have a peek into your everyday happenings..these Russian pancakes are so nicely done! I make pancakes but never tried yogurt pancakes like this. They look so soft, fluffy and absolutely delicious. Wow mayuri di am a fan of your writing you should think about writing a book someday , you narrate so well and we love reading your intros .. From the beginning of the marathon I have been religiously reading all your intros you take so much effort to explain everything about what happened that day to the history of the recipe .. Hats off to you !! The pancakes looks awesome !! I would love to skip the egg and try it some day !! I love to read the intro you give to your dish mayuri, gives a sneak peek into what we can expect below! those cute fluffy pancakes look yum! i dont mind serving them with a generous serving of jam and cream, makes it a wonderful morning!!! We love pancakes on weekends and this one with the yogurt sounds so interesting. Love the texture of the pancakes and I am sure this will be a hit in my house. Thank you Sandhya and they were so easy to make, liked the small tiny size. The pancakes look very soft and perfect spongy.I am sure they would make a nice and delicious breakfast to start the day. Thanks Sapana, they are just the perfect size to enjoy them for breakfast. Nice reading the post Mayuri. I do agree, all the tourist places have become so filthy and the locals have to live with it! !And the pancakes look so cute and fluffy! Pancakes are perfectly cooked.. so moist and fluffy.